CanSkate is a dynamic learn-to-skate program that focuses on fun, participation and basic skill development. In CanSkate, skaters learn basic skills to prepare them for any ice skating sport or recreational skating. Skaters receive instruction from nationally-certified coaches in a 10:1 coach and program assistant to skater ratio. It is Skate Canada’s flagship program and is one of the most sought-after skating programs in Canada. Participants earn ribbons and badges as skills are mastered. This unique intro-to-ice environment is designed to stimulate and maintain interest and enthusiasm among skaters, allowing participants to gain the physical competency and confidence to remain active for life! 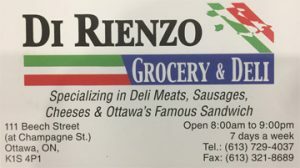 All you need are skates, a CSA-approved hockey helmet, long pants, mittens and a warm sweater or jacket. Dress in layers as some rinks are warmer than others. Check out this video for tips on equipping your skater properly for CanSkate. Pre-CanSkate is for 3-year-olds who are just learning to skate. The objective of our Pre-CanSkate program is to get the skaters comfortable on the ice. We recommend that Pre-CanSkaters dress warmly and in layers. We recommend warm pants covered with splash pants to keep the skaters dry and warm. Thicker mittens are also recommended. Helmets are mandatory, and facemasks are recommended at this level. We often draw pictures on the ice with permanent marker, so we recommend dark, older clothing. The Pre-CanSkate program is taught by Professional Coaches who are assisted by trained Program Assistants (older club skaters). This session is for children aged 4 years or older who are with an adult learning to skate together on the same session. This session is also open to children skating on their own (without parents on the ice). CSA approved hockey helpmets are mandatory for all CanSkaters. NSC is excited to reintroduce our Parent & Tot session beginning this fall. Parent & Tot is a unique opportunity to take part in your child’s skating instruction and learn how to motivate your young skater while learning from the best! This program is designed for skaters who are 2-3 years old and wish to have their parent join them on the ice. Parents will assist their skater while they are instructed by our qualified NCCP Coaches. To register for our Parent & Tot session, your skater must be registered as a “Child” and the parent must also register as an “Adult” as both parties must purchase a Skate Canada Membership ($35.65). Adults will be charged the Skate Canada Membership fee only. Children who are 4 years old or older do not require a parent to be on the ice with them and are asked to register under CanSkate for this session. They are to be instructed independently without the aid of their parent. The Advanced CanSkate session is for skaters who have already completed badge #2 in the CanSkate program. 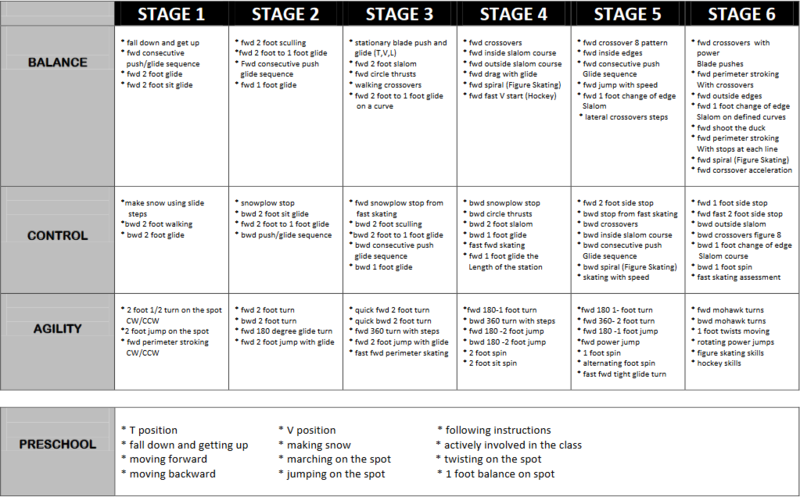 This is the fast track program that leads into our “Rising Stars” program for figure skating as well as improves speed and agility for skaters who aspire to move into hockey, ringette, or speed skating. CSA approved ice helmets are mandatory. Practice putting on your skates and tying them. Parents MUST stay in the arena. After the first lesson there will not be a check in table – Please retrieve your child’s name tag at the rink door. The name tag needs to be attached prior to getting on the ice. During the first couple of lessons, your child will be assessed using the chart at the top of this page. Once assessed, your child will be placed in a class with peers of similar skating ability. You will see coaches and Program Assistants (PA) on the ice. The program assistants are skaters from our advanced skating levels who are there to assist the coach. The coaches set up the programs and assess each child. There is no set rule for progress, it is unique to each child. During the session the coaches will observe and assess. If your child is progressing quickly or they are having difficulty keeping up they may be moved to a different class. Each child needs to feel challenged without feeling overwhelmed by the sessions. On the last session there will be report cards given out to each child. The cards will capture the current skating level and may include a ribbon to indicate that your skater has passed a CanSkate level. 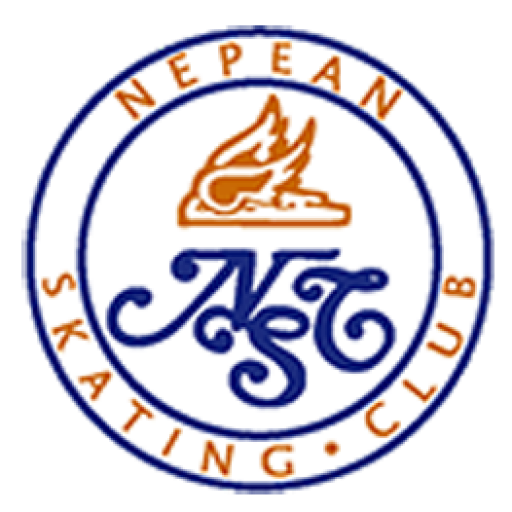 Once on the site you can view the programs that the Nepean Skating Club offers. On the far right is a Categories drop down. To make viewing a little easier, use the drop-down and select CanSkate. You are now only shown the CanSkate programs.